Originally called the South Laboratory, Bennett Hall was built in 1919. The building has seven levels and contains 64,494 gross square feet of space. An addition was made to the building in 1947 with a major renovation in 1962. An $8.9 million renovation in 2008 brought together – for the first time ever in one location – the 10 educational programs that comprise the School of Allied Health Professions on Levels 3 through 6. The Department of Anesthesiology administrative and faculty offices remains on Level 2 and the Counseling and Student Development Center in on Level 6. 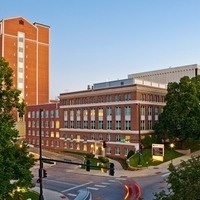 The name of the building was changed to South Hall in 1990 and to Bennett Hall in 1995 in honor of the late Dr. A. Lawrence Bennett, former chairman of the UNMC physiology department who worked in the building throughout his entire 39-year career.